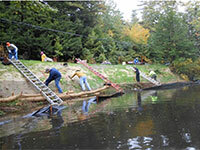 Since 1946, the State Conservation Committee, a State of New Hampshire Department of Agriculture, Markets and Food affiliate, has provided conservation leadership, guidance, and oversight for the ten county Conservation Districts. The State Conservation Committee (SCC) confirms Conservation District Supervisors; coordinates the Districts' work and fosters coordination with other natural resource state and federal agencies, organizations; and the legislature. The SCC receives a portion of the Conservation license Plate (Moose Plate) funds and distributes the funds in grants that support conservation activities.